Does God love Satan? Can Satan repent and be saved? What does the Bible say about how God feels about Satan? I have had people ask me why Satan can’t repent and still be saved. All I can answer is that God knows the end from the beginning and that history is His-story. Prophecy is history written in advance and since God knows what will happen into eternity, then He already understands that Satan will not repent, therefore Satan will not ever be saved. How do we know? If we take just a quick reading about Satan’s soon coming fate from the Book of Revelation, we know his ultimate fate, “I saw an angel coming down from heaven, holding in his hand the key to the bottomless pit and a great chain. And he seized the dragon, that ancient serpent, who is the devil and Satan, and bound him for a thousand years, and threw him into pit, and shut it and sealed it over him, so that he might not deceive the nations any longer, until the thousand years were ended. After that he must be released for a little while” (Revelation 20:1-3). Satan is bound for some time but then after “the thousand years are ended, Satan will be released from his prison and will come out to deceive the nations that are at the four corners of the earth, Gog and Magog, to gather them for battle; their number is like the sand of the sea. And they marched up over the broad plain of the earth and surrounded the camp of the saints and the beloved city, but fire came down from heaven and consumed them, and the devil who had deceived them was thrown into the lake of fire and sulfur where the beast and the false prophet were, and they will be tormented day and night forever and ever” (Revelation 20:7-10). So we see that Satan’s fate is sealed, otherwise God would not have inspired the Apostle John to write of the Devil’s ultimate fate. That he will be cast into the lake of fire and be forever tormented there, day and night, is as sure as you exist today reading this. This is certain for “Scripture cannot be broken” (John 10:35). I believe it is never too late for human beings to repent because as long as they are drawing breath, they have time because they are not judged until they die. With Satan it is different. When God created the angels, they were made for eternity and they determined early on their fate whether they would obey God or not. When Satan’s pride lifted him up and he wanted to not only take over the throne of God but to be in place of God, he was cast out of heaven. At this early point, Satan could have repented and confessed his sin to God but pride has a way of blinding us creatures. Pride destroys our rational thought and behavior and makes us bigger in our own eyes than we actually are. How deceived could Satan be to think that a creature could overtake the Creator Himself? That is unimaginable but that is what pride does. God was well pleased and said after the creation that He “saw everything that he had made, and behold, it was very good. And there was evening and there was morning, the sixth day” (Genesis 1:31). Since what God originally created was good and He was well pleased with it, we can assume that He was also pleased by His creatures that He had created because humans and the angels were part of His creation. We can conclude that God was pleased with both created things and creatures, including mankind, animals, birds, insects…and surely the angels. The difference here was that the angels had already been in existence before the earth was created. How do we know that? God spoke to Job about this. The Book of Job is believed to be the oldest book of the Bible, written before Genesis. In this book God told Job about the angels in chapter 38:5-7 “Who determined its measurements—surely you know! Or who stretched the line upon it? On what were its bases sunk, or who laid its cornerstone, when the morning stars sang together and all the sons of God shouted for joy?” The phrase “the sons of God” is understood to be angels. God implies to Job, where were you when the angels were created? Since God created all the angels at the same time and that they are spirit beings, we know that they will live forever. God speaks to Ezekiel about the fallen angel, Lucifer, who was once perfect, saying in 28:13-15 “You were in Eden, the garden of God; Every precious stone was your covering: The ruby, the topaz and the diamond; The beryl, the onyx and the jasper; The lapis lazuli, the turquoise and the emerald; And the gold, the workmanship of your settings and sockets, was in you. On the day that you were created. They were prepared. You were the anointed cherub who covers, And I placed you there. You were on the holy mountain of God; You walked in the midst of the stones of fire. You were blameless in your ways From the day you were created Until unrighteousness was found in you.” But Satan became proud and his “heart was proud because of [his] beauty; you corrupted your wisdom for the sake of your splendor. I cast you to the ground” (Ezekiel 28:17). Since God is a God of love, surely he loved His creatures, Lucifer-turned-Satan included. One of the greatest attributes of God is that He is a God of love (1 John 4:8). He loves us and He so loved the world that Jesus came to die to redeem us (John 3:16). Why would God feel any less than love for His angelic creatures since God is the perfect fulfillment of love? God loves humanity and so how could He not also love His angels…even the fallen ones like Satan and the demons. God hates the sin but loves the sinner so He must also still love Satan and remembers Satan before his fall. A person is loved not by what they do but because they are His creatures. 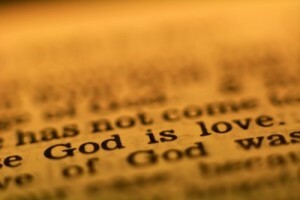 God is love, therefore God loves His creatures and this includes those who have and will reject His Son, Jesus Christ. It is too late for Satan to repent. God knows His ultimate fate (Revelation 20) but there is still time for you to receive eternal life by repenting, confessing your sins and putting your trust in the Savior. That is my prayer for you today because this is the day of salvation (2 Corinthians 6:2). Tomorrow may be too late. For you who are reading this and are not born again, it is not too late like it is for Satan (Revelation 20:10). Why not put your trust in the only One Who can save you? That is Jesus Christ (Acts 16:30-31). If not, you can read about your own eternal destiny and it is not a pretty picture (Revelation 20:12-15). Resources: New International Version Bible THE HOLY BIBLE, NEW INTERNATIONAL VERSION®, NIV® Copyright © 1973, 1978, 1984, 2011 by Biblica, Inc.™ Used by permission. All rights reserved worldwide. The title just grabbed me and pulled me in. “Does God Love Satan?”, very interesting. Thank you for tackling this and giving us your insight into this subject. God bless you, brother. Thank you Robert. I had to struggle with this one but I concluded that God’s very essence is that of love. As always, your words of encouragement are so good and I thank you my brother. Although I still am not sure if God loves Satan (although your article does make sense), I am amazed once again at the knowledge brought forth from you Jack. I always learn so much from your articles. Actually today our pastor read a scripture perfect for this, “The fear of the Lord is the beginning of knowledge; fools (also translated as ‘ungodly’) despise wisdom and instruction.” (Proverbs 1:7) Had Satan had a reverent fear of God, he would never have allowed his own pride to overtake him. God bless you brother! Thank you Derek for your encouragement. I struggled with this too and I cam to the conclusion that God, even with the creation, was well pleased and that God only creates creatures that He loves. Loving the sin? No, but loving the sinner. Thanks brother. “God hates the sin but loves the sinner.” There’s a lot of debate over this. Many christians believe that God hates the sin and the sinner. What do you think of this? If God hates the sin (which HE does) AND the sinner, then we are all in serious jeopardy, which I don’t believe we are. God so loved the world that He sent Jesus to die for us (John 3:16)…while we were still sinners and enemies of the cross, so God does hate sin but loves the sinner, of which I am thankful and am fully acknowledging being a sinner. Jesus was said to be a friend of sinners and even loved the young rich ruler who walked away after rejecting him because of his great riches. What do you think Troy? I thank you for this article . I used to pray that Satan would repent and be saved reasoning that if he did we would all have great relief! Well I suppose that is another testimony that our natural reasoning is in error. This article makes great sense and I am thankful for it . As far as the post that queried about ‘hate the sin and loving the sinner’ I have also been confronted with that one. I am thankful that the Lord loves us period! But this issue does deserve an answer as you gave one . Another answer that was put forth from another person was that it is not that God loves us if we are intent to CONTINUE sinning …that is to sin willfully with disregard for the command to ‘deny yourself , take up your cross and follow HIM….in this way it seems that those who presume upon the offer of Salvation as something like a ‘get out of Hell free card’ despite continuing in sin they are saved. This is difficult since this implies that God will give entrance into His Kingdom regardless of HOW we live after confession of our believing in Jesus Christ as Lord and Savior . Mat 24:13	But he that shall endure unto the end, the same shall be saved. Mat 24:11	And many false prophets shall rise, and shall deceive many. Mat 24:12	And because iniquity shall abound, the love of many shall wax cold. I have seen this as a result of false teaching and thankfully I have seen those who were deceived go on in faith in GOD but wiser having been deceived and betrayed by unscrupulous teachers. This is difficult to overcome until we realize how the evil works in this world and how God reveals to us how we become deceived….There are some wise guidelines for us to learn how to avoid being deceived. Learning how we can be deceived by our own hearts is one . Back when I was first getting into reading and following the Lord I did not realize how to tell a false teacher…I was hungry and zealous to learn all I could so I could walk in His way …Many young and new unlearned believers in the same eagerness to learn about what they knew they did not as yet know fell into following those who saw an opportunity to take advantage of this condition. The Devil seeks to pick off the lambs …the young …he does not spare the flock . Our Good Shepherd is not absent but we have the freedom to choose and if the devil and his hoard can deceive and lure us to choose to begin to take in false ‘food’ then we will have to be ‘rescued’ by way of not allowing everything we are taught to be believed without examining all things by the Word. One way I find that I was deceived was I did not realize the truth about my own heart being deceivable but yet not having confidence in m own mind …when the scriptures would arise from where I had sown them early on …from just reading day and night I STILL believed I was so new that I would not know wisdom from what came to mind and that I was ‘just trying to avoid ‘ being taught! WOW…>I actually became open to deception because I did not trust that the things that arose ..scriptures even …where FROM the LORD! I thought it was my own fleshly mind trying to escape being disciplined! Does this make any sense to anyone else here? I even submitted to two people who had lead me to Christ kidnapping me for days on end ..until the Lord delivered me through my silent plea to make a way for me to escape from them ‘if it was HIS WILL”! How deceived could one be to allow themselves to be mistreated you might say? I knew from reading the word that the carnal mind is emnity against GOD and that I was newly walking after the things I read but had not read everything with confidence in what I read and understood …later I recalled that those scriptures that arose while they were demonstrating ‘false signs ‘ was RIGHT ON …of course! But I did not pay heed because even though I recognized it AS scripture I thought it was ‘just me ‘ trying to escape being brought under the discipline of those who ‘knew better’ and were intending to help me ‘overcome’ my flesh! How deceived I was …since then I have been deceived while trusting people who ‘came in the name’ …having seen that we were to ‘test all spirits to see if they are OF Christ ‘ but I did not know HOW to do that ! I kept asking the Lord for HOW to know …and over time I have come to learn that if it does not track with the WORD …all of it ..that it is not OF GOD. Of course that has meant I needed to become equipped with the Word. In effort to learn whether someone was sharing what IS OF the Word of GOD in truth I have been led to study and compare several who appeared to KNOW a LOT of scripture and seemed to have wisdom beyond what I already understood ..trying to be cautious all the while …some eventually proved to be false and even one totally began to declare the Word of GOD untrustworthy and Jesus as only a man …and eventually declared the whole Bible as a snare to deceive people …he was revealed to be one among the anti-Christian “scholars”…Christ deniers! The deceiver of the soul is a LIAR as it says ..the Father of lies…he is crafty and he also has a handle on scripture ..can twist it beyond what we may realize anyone is capable and make lies SOUND so convincing …YET as we learn more and more …studying what the scriptures will offer us and relie upon the Lord to bring us understanding ongoing we will be taught by the Lord …through His spirit…in the inner man. Truly the Devil prowls around seeking whom he may devour …a lion who roars …freezing his prey when they ought to flee…. Since I was deceived by so many who seemed to be sincere and demonstrated knowledge of scripture is has caused me to be more cautious ..though not wanting to be suspicious of everyone claiming the name of Christ Jesus . Taking someone ‘s word for it is dangerous and works to wear away the faith of the saints …we see the distrust of everyone and their words cause many to discard the word of GOD because of distrust of man’s word….They turn away due to many public revelations of the feet of clay of many who have been held up as ‘solid citizens ‘ in our media and other realms where we would expect to find a person of character. When some who are set forth ‘believers’ of faith with public platforms in the media …are demonstrating acquiesice to various sinful acts….accepting and not discriminating in areas of culture that God declares as sinful! This is a deliberate attack and twisting of the perception of Satan…it is sad and indeed the love of many grows cold as this goes on …turning from the standard of GOD’S word to ‘soften the blow’ which was meant to break the sinful and hardened heart and bring them to Christ. God’s Word seems ‘harsh’ to those sold into sin by deceit. It is difficult to receive the truth when we have grown up with the idea that Love is only that which tells us what we want to hear…just as in the OT where people rejected the true prophet and turned to those who they told to ‘prophecy SMOOTH things” …. There is coming a time and has been …when they think they do God a service as they try to ‘eliminate the obsticals’ to their paradise ON earth. Jesus told us that his kingdom is NOT OF THIS world. I am thankful to learn and know from HIM how to tell the truth from HIM who is truth. I am not confident that I can trust anyone fully just by their words. I have apparently had a lengthy lifetime of being deceived one after another …betrayal by friends…bible teachers….and a husband who lived a double life unbeknownst to me as I taught our children the faith. He had an adulteress and had two children all while I was continuing in my walk and endeavoring to live by what the Lord would teach me . This is one of the greatest trials of my faith as yet. To live for 33 years with a man , loving him …trying to do all that the Word says in my relationship with him and he decisively turning from the Lord , me and our family to do such a horribly deceitful thing with a woman who did so with full knowledge of his never leaving his wife and family. I told him it did not have to be an ‘either /or’ decision but he insists that he ‘broke me and that there is no use’ …This seems to me to be a ‘form’ of the break up statement ..”It’s not you it’s me’ …which he has said at times in our marriage I now realize when he would say ” I am not the man for you’ …that spoken upon the birth of our first child. So with all the ‘experience’ of being deceived by people I have trusted it has been hard yet I see no other as trustworthy other than Jesus . Being betrayed by believers and bible teachers is one of the biggest tools in the arsenal to try to break down the faith of believers…I am thankful that I met the Lord before I had these deceivers come across my path. I had not known how to discern ..not having been raised in a family which practiced godliness but was more like the moralists of the 1950’s ….if you follow what I mean. Thinking as Humanism led us to believe when we did not know the word ..that all people are born GOOD …has been ONE HUGE leveraging to deceive as people are not thinking about how others may do willful sin thinking it is ‘good’ …Scripture tells us that ONLY GOD is GOOD and with that we are led to see how topsy turvey this world is ! Pro 14:12	There is a way which seemeth right unto a man, but the end thereof [are] the ways of death. We cannot count on what ‘seems right’ but we must KNOW what God’s word reveals IS right….otherwise there is a gap in our understanding by the which we may be deceived…. I have found that I cannot trust anyone fully …not those who claim his name…not those who SAY they love me …not anyone in a position of authority in any public office…It seems like a sad thing no doubt and lonely but after all these years of allowing for the weakness of flesh and giving people the benefit of the doubt I am more cautious …more vigilent …and trying to make sure I trust the Lord. I found myself wondering how to know the difference between wisdom and fear ….trust faith in the Lord and faith in myself or people …Trusting what is written realizing I MAY not have all the equipping of the Word as yet to determine the wisest thing to do . Presently the challenge is finding out what I need to be doing in the situation with my husband …living with forgiving him seemed to only bring about his taking advantage of this …and accusing me of not being forgiving if I asked him to turn to the Lord and follow after Him …he rejected that …and he is not proactive in seeking to be accountable …in order to establish transparency in our marriage. Thus I am having to learn that this is not ‘godly sorrow ‘ or ‘repentance…’ but I am still trying to live in this covenant marriage despite this …it is hard. I appreciate your support in prayer for me to come to understand what I am to do if anything in this situation. OH dear this turned into a different post than I had anticipated but so be it….thank you for your prayers as I continue to endeavor to live after my Lord in all things. Nicely said Kris. It is hard to figure out which is godly sorrow and which is repentance. I suppose that godly sorrow can make us feel hopeless and helpless victims but repentance makes us fall on our face and seek forgiveness. I just love your writings. Well ….One thing that is ‘good’ about being betrayed …at least for a follower of the Lord is that it puts more pressure on us to keep our word to the Lord…despite all things. Godly sorrow leads to repentance…as the word says …as I have been looking for this in my husband I have come to see that the true repentance is demonstrated by CARING about the damage that one’s behavior does …to oneself and others. It calls for and shows us with a person making a serious effort out of a desire to change and to learn what they need to do to not only change but to AVOID repeat performances . To make ongoing effort out of recognizing that they CAN learn how to do that…. My husband continues to go about his life by his own means to try to do what he believes is ‘good enough’ all the while casting off any and all counsel or knowledge of what is needed by me, our marriage, our family and simply a changed life which would result in his actually being able to use all of his sin as a vehicle to help others avoid the same life choices. I had tried to get him to see that if he would seek out what God’s word would advise him he might prevent the children of adultery to not go the same way and learn of Jesus Christ . He reacted the same way as when he turned from the Lord a few years after our wedding …when he began working in a corporate environment instead of being a sports scout….working with an only one person , an older man married for many years and when we went together and served in our fellowship together. He has rejected any idea of salvation and reconciliation with the Lord and now me . I see that his lengthy adultery with the OW who is a devoted new ager and a self confessed “leftest’ and in her own words “as liberal as you can get’ ….all of her ‘isms’ seemed to show up in my husband’s vocabulary as I look back over that time …. Luk 17:3	Take heed to yourselves: If thy brother trespass against thee, rebuke him; and IF he REPENT, forgive him. Luk 17:4	And if he trespass against thee seven times in a day, and seven times in a day TURN AGAIN to thee, saying, I repent; thou shalt forgive him. Mat 9:17	Neither do men put new wine into old bottles: else the bottles break, and the wine runneth out, and the bottles perish: but they put new wine into new bottles, and both are preserved. What is the KEY to not ‘perishing’ ? Luk 13:3	I tell you, Nay: but, except ye repent, ye shall all likewise perish. 2Pe 3:9	The Lord is not slack concerning his promise, as some men count slackness; but is longsuffering to us-ward, not willing that any should perish, but that all should come to repentance. HOW to avoid ‘perishing” …. Rom 2:4	Or despisest thou the riches of his goodness and forbearance and longsuffering; not knowing that the goodness of God leadeth thee to repentance? Mat 16:24	Then said Jesus unto his disciples, If any [man] will come after me, let him deny himself, and take up his cross, and follow me. Luk 9:23	And he said to [them] all, If any [man] will come after me, let him deny himself, and take up his cross daily, and follow me. Rom 6:11	Likewise reckon ye also yourselves to be dead indeed unto sin, but alive unto God through Jesus Christ our Lord. Jhn 5:24	Verily, verily, I say unto you, He that heareth my word, and believeth on him that sent me, hath everlasting life, and shall not come into condemnation; but is passed from death unto life. 2Cr 5:17	Therefore if any man [be] in Christ, [he is] a new creature: old things are passed away; behold, all things are become new. True repentance is acknowledging that Jesus Christ is your saviour. Acknowledging and He did that for all of us that our sins are forgive. It is the the inner nature of man that is changed and when that happens, it will show outwardly. Our whole character changes It is be because the Holy Spirit lives in our hearts. That is a GREAT definition Ed…Thank you ! In the case of my husband’s adultery as I know many others who are struggling with spouses who have done this there is a great need to OBSERVE this change. For me I was looking for the attitude and behavior change…which back when my husband confessed Jesus Christ as Lord and believed God raised him from the dead I did observe …but not a complete overall change. I also see that in the scripture where he says ‘depart from me you workers of iniquity I never KNEW you’ that the ‘seed ‘ of the Word had not taken root yet those who he tells to depart from Him have come with statements of having done ‘many mighty works in His name’ …They were thinking that as they thought they had served Him according to faith that they are saved …yet the word ‘iniquity’ as I found it defined is ‘law less ness’ without doing so according to HIS word . He was not in them directing them because they did not walk according to the truth of His Word. It was not IN them ..yet they claimed to be saved and that THEY ‘knew’ Him. To ‘know’ here has a meaning of ‘impregnating’ as we are to take the “SEED” which is incorruptible INTO our hearts and minds and live by it …we are to “keep ‘ His Word. And to live by it . So it seems that to be saved would involve more than just a statement of faith but a testimony of concern about learning and then doing all that He has said while looking unto Him to correct our way. If we will not heed or desire to be corrected and to follow after the things that the Lord instructs us to think and do through His word then how will we be living IN His life? If we claim His name but do not do what HE says …HE has said ” Why do you call me Lord ,Lord and do not what I say’? We are not SAVED BY our ‘works’ but our life after our confession should manifest more and more ‘repentance ‘ in that we care about learning what we need reproof and correction in our ways . If not how would we know we trust Him. If we be without chastening how will we be His Son’s INDEED ? I think when I came to the Lord I became concerned about all that I did not know I was thinking that would not be according to HIS standard and point of view so I was hungry and thirsty for having those instructions. At length I was concerned to find out how to make sure I was continuing in His word which is spirit and truth …God tells us that he seeks those who will worship Him in spirit and in truth …By way of His word which is both spirit and truth according to Jesus Christ. It is the ‘measure ‘ by which we shall ALL be measured at some point so I view the Word also as an ‘open book test’ whereby we may know what we will be held accountable to . My husband was led away . Though he walked for a while and seemed to be joyful in it he stopped ‘receiving the word with meekness’ which is one of the heart attitudes needed for us to be instructed. Was he ever saved? This is a question that many ask and I hate to say ‘no’ yet it is difficult for me to say …’falling away’ is something the Word speaks of and yet the Lord would allow that anytime before my husband’s lifespan expires that perhaps he would grant him repentance IF he were to bring forth fruits meet for it as the Pharisees were told they needed to do. Is this what we can hope for after my husband has walked and then walked away for such a lengthy time or is he among those who are like the dog returning to his vomit as scripture says . What does it mean for one to fall away and it is ‘impossible ‘ since he has crucified the Lord again …I wonder. I am continuing to pray for my husband and even the woman and the two children he had with her. He is presently in our home but remains distant and resistant to the things he knows are offered to him by the Lord. Thus I cannot help but wonder if indeed he is going to have to be dealt with by the Lord in ways that are other than have been up to now. His heart seems sorrowful but not to the end of returning to seek the Lord . He is apologetic..has ceased the sexual activity with the OW and thinks that is sufficient …but he has refused to enter into the faith he once knew. He told me he reads the word and does not understand it . HE refuses to go to any church assemble of any kind. His worldview was not OF the Lord but moved to the ways that the OW and his co workers have …it is not of God but is OF this world . So ….repentance is indeed to believe and have the Lord AS LORD …but to only confess without a desire to become more and more equipped to be faithful to the truth is the thing that I am now very concerned about for his soul. I find it difficult to trust his words and true we should be cautious to observe the sincerity of the words of those who say and yet have no indication by a change of their ways or indicate no desire or love for the Word of God …these are things we do well to take into account as well don’t you think? The seed is the word of God. The farmer represents the sower, the one who shares the message of God and the soil is the person who receives the message of God. Now, there are four kinds of soils. 1. The Roadside Soil – These People are the slanderers of the Gospel of Jesus Christ. They will have nothing to do with the good news of salvation. It’s like talking to a wall. They will tell you to shut your mouths or else they will end their friendship with you. Their hearts are as hard as a rock. They will live their lives according to their own dictates. They only love themselves and no one else. They are arrogant and proud. They glorify in themselves. 2. The Shallow and Rocky Soil – They receive the word of God from the one who shares with them the gospel. These people grow so fast in the word of God but because they forget to pray, read and study the word of God, like the flower they wither. They go back doing the same things they used to do. They have forgotten who God is and the resurrection message of Our Lord and Saviour Jesus Christ. The seed that was planted in them is now totally gone. 3. The Thorn Infested Soil – When troubles and worries come their way they panic and forget all about God. Their faith is so shaky and it falls apart. They do not seek God for their solutions. Others will lean on money to solve their problems. Money cannot save you from your problems. You can even lose it all. Your riches cannot save you from deadly sicknesses like cancer and so forth. If it is your time you must accept it and know that you are going to be judged. Some have become christians and still indulge in the pleaures of these world. We cannot be double faced when we are a child of God. We must only obey Him. This is why the seed that has been planted in them gets choked up. 4.The Fertile Soil – They received the message of God from the one who has shared it to them with glad tidings. They hear the word and follow the directions that God has given to therm willfully. People of thiis kind help spread the resurrection message of Jesus Christ. Their faith becomes stronger everyday. They pray, read and study the bible every single day. They live in this world though they are not of this world. These are the true christians that will inheriit the Kingdom of God because they have remained faithful to God.to the very end The seed which is the message of God stays with them forever. This is just a reminder because one day this world will come to an end and we will have to account for all the things we did on earth. What you said in your last paragraph is true. How refreshing to hear such a great exposition of this passage. It is so clear in how we observe how some people shrivel, fall away or go on to grow up in the word. It is also a good exhortation for us …a warning to examine ourselves and he who stand take heed lest he fall too! I feel strengthened to read your encouragement …It is that YOU are saying what the WORD says…hearing another person take the Word in his heart and mouth has a way of building up that no other does….not just seeing a walk but actually hearing it out of your temple…. By this I guess I mean I feel sometimes a loneliness even among those who may claim to be HIS …because after some time …there seems to be a lack of love for the Word …..maybe it is a lack of their having spent time in the Word and I so desire to have a sharing among those who are His . I realize that no everyone makes time for Him …but they do rejoice to hear when I am excited to share something I am learning ….yet have nothing to share with me from their own study. Some are only involved in some prepackaged teaching series…I suppose that is a good thing …the Lord may teach us from here and there among those offerings…if nothing else as an ‘assignment ‘ to go to Him and search out what is offered in His word. I am not above any …but I have been ‘stung’ before among those who said they loved Him and really only went about ‘churching’ like it was a country club….and so I not only did not find the ‘fruit’ which I was hoping was to be among them of the various maturations of the Word but in some instances I found ‘bad fruit’ which is more or less the doctrines of demons …new age isms ….or some fractions of the faith. It is confusing to new believers to try to find a place to have fellowship as I remember not realizing there were so many factions among those who claimed the Lord as Lord. The many ways people claimed that we MUST follow Him….I did not know about Armenianism, Calvinism, and other ways that have been included in historical facets of the faith…I just kept going to the Word because I felt I could trust the Word. I say that people do not know what they do not know and often are convinced that one of these is the only right way and I think it skews their faith….I still find it difficult to understand these various views taken up . I remember when I first came to the Lord in my parents home …I had been in my room and read the Word asking the Lord to open my understanding and teach me what HE would have me understand….it was amazing …I went out to tell my mom excited to share with her. I would have thought that she would rejoice and be glad….instead she mocked me ! She felt I was too enthusiastic….so it is that those who come to Christ soon learn that though it would be thought that becoming less involved in willful sin and the various isms of the world would be considered by others as a GOOD thing…is not always greeted as such. The fallen world is so concerned with ‘fitting in’ and ‘not being embarrassing’ they fear this Word…the Lord and His word is spirit and it is not of the world and the world hates it….and Him…the LIVING WORD REVEALS sin , lies and darkness and those who are serving it HATE it .. I remember being so hurt and startled over the years especially with the reactions from those close to me …and especially among those who had appeared to be believers….but the WORD itself was targeted for debate and various claims and those were defended while the very Word itself was denied. So it is ..it is a rejoicing when we find others who are taking God at His Word and willing to consider that further study will clarify any confusion we may have . I am thankful for those who love the Lord and are willing to stay faithful to grow up in that word. Thank YOU for your sharing such a wonderful and clear Word on this section which I concur and love to have seen I am not alone in my searching out the Word or understanding yet trusting the Lord to complete more and more my understanding and learning to apply …submitting to His work IN me ….and may this ever be for all who love His appearing …while we await and go on through this lifespan! This is great Ptr. Jack. I really have so such to learn from you. One thing I really certain of, is that God is always consistent of His love for His creations specailly in all human beings who have been made in His image. The perfect reflection of this love is Jesus Christ who freely give His life for our sins. Prises be to God for giving you the knowledge to share with us this message of love. God Bless! Amen and amen and to Him be all glory, honor and praise . Great subject, God ia a God of love. He hates vthe sin but not the sinner. I love you my brother in Christ. I pray God sends you divine appointments in the next day or so that you can share the gospel of Christ with since I see you as a strong believer in the Great Commission and I thank God for you Mr. Gonzalez. Thank you so much for your very kind words. I appreciate that. Please come back again soon my friend. I was asked the question by someone I met and I couldn’t answer…. Please pray for Luke in Australia that he will have someone give him this answer to this question….. Luke wasn’t sooo likable…guess that is because he didn’t believe Jesus’ love for him : ( This answer would turn his life around….. I will do so Maggie. Ultimately, God is responsible for someone being saved so that may take the weight off your shoulders because God is the One Who brings people to Christ (John 6:44) and that any answer, whether it satisfies Luke or not, will not be the deciding fact as to whether he or anyone will be saved. Does that help Maggie. I will pray for him and thank you for caring for his eternal destination. 1.Where is the prison where satan suppose to be? If your answer is hell/hates than where is hell /hates at? 2.Was satan already here before Adam & Eve? 3.There’s a giant crater hole in Siberia, Russia that I read on CNN, could that be the opening of satan being release? Where is the prison where satan suppose to be? If your answer is hell/hates than where is hell /hates at? Satan is not yet bound but is headed for the lake of fire (Rev 20:12-15) but today he is roaming about like a roaring lion seeking whom he may devour (1 Pet 5:8). 2.Was satan already here before Adam & Eve? Yes, he was the one who tempted Eve in the Garden and existed before mankind did. 3.There’s a giant crater hole in Siberia, Russia that I read on CNN, could that be the opening of satan being release? Not sure about that…it could be. Do you mean Satan being released after the 1,000 years? Too many weird things happen already as predicted in Revalations… So true…the time of CHrist’s second coming could be close my friend. Thank you for your comment and question Elex. Satans fate is forever sealed it is written in Revalations chapter 22 v 18 & 19. Can you show me in the Bible where it says God loves Satan?